which means I did a lot of baking. 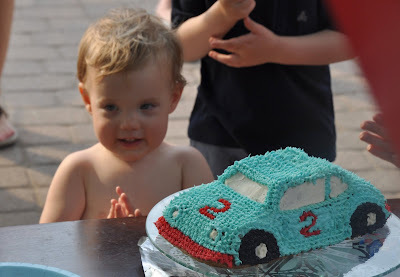 He is obsessed with cars right now so I bought a Wilton 3D car cake pan and baked him a car cake. I also made Ina's chocolate cake (which I will be sharing with you soon) and after all that I thought I needed more cupcakes just in case but I was low on flour. I usually try to make everything from scratch, especially baked goods but sometimes there isn't enough time in the day or ingredients on hand and a box mix has to do. This is my favorite doctored box cake mix recipe! Preheat oven to 325 Degrees. Place rack in center of the oven. Line cupcake pan with paper liners. Melt the white chocolate in microwave stirring every 30 seconds until melted or according to package directions. Place the cake mix, water, butter, whole eggs, egg white and vanilla in a large mixing bowl. Pour in the slightly cooled white chocolate. Blend with a mixer on low for 2 minute. Stop the machine and scrape down the sides of the bowl with a rubber spatula. Mix for an additional 2 minutes. Scrape down again if needed. The batter should look well blended. Line the cupcake pan with liners and fill approx 1/2 way to 2/3 full. The cupcakes have a flat top once baked so you don't want to overfill with batter or your cupcakes will spill over when baking. Bake the cupcakes until they are golden brown and spring back slightly when lightly pressed with your finger, about 20 minutes. Remove the pans from the oven and place them on wire racks to cool for 10 minutes. 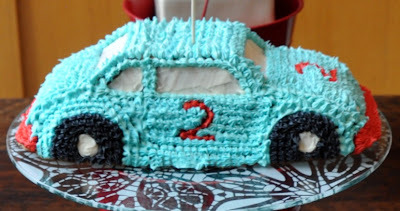 Allow to cool completely, 30 minutes or more before decorating. Meanwhile stir the raspberry jam in a bowl add a little chambord if desired, to taste. Fill each cupcake with a little jam. I have a tool for this but you can also use the cone method. Basically, you cut a cone out of the center of the cupcake, spoon in jam, cut off the tip of the cone and put the cone top back on. Once you frost you won't see the cone (circle) that you just cut. Melt white chocolate over double boiler (or in microwave), stirring often. Once melted removed from heat and let cool almost completely. Meanwhile cream butter for about a minute. Add chocolate to butter. Continue to mix at low to medium speed while adding vanilla. Gradually add in cream and sugar until frosting reaches desired consistency. Frost the cupcakes once they are cooled. Decorate each cupcake with a fresh raspberry. 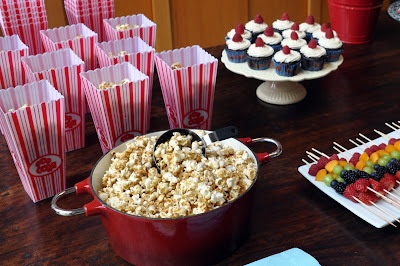 you did a fantastic job, I have been eyeballing those popcorn holders too! happy 2nd. You really made a great job!! everything look wonderfull!! 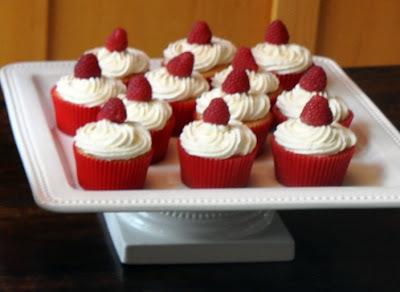 I am thinking of making these and I was wondering about the texture of the cupcakes? Are they very dense? If so, would you have any suggestions on how to make them less dense? Thanks. 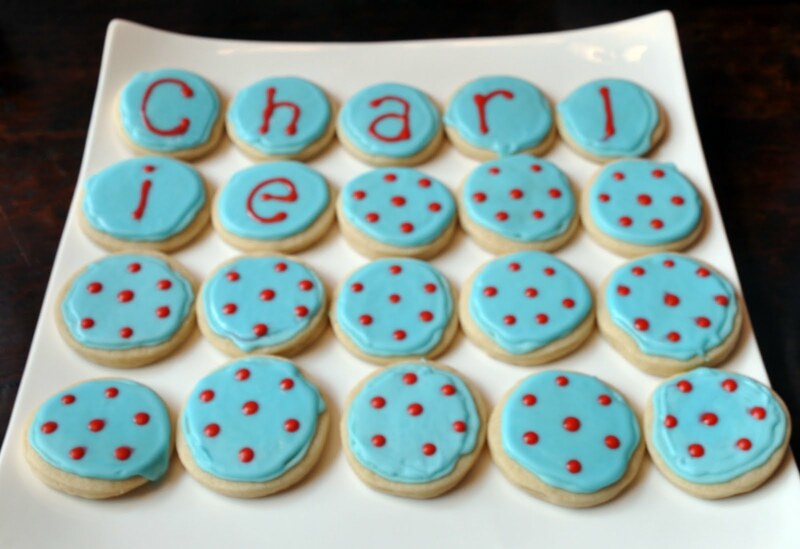 Really looking forward to making these! texture is light and airy...my favorite!